A new kittens at home >w< yay! My new amigurumi! I love all cats!! For all lovers of animals and especially cats! In this design got to add my love for cats and knit. It is a very simple pattern that is based on a simple square, it's fun and quick to knit, is sooo easy to made that everyone can knit it. Reproduction for sale is strictly prohibited! Cubic Cat por Carmen Pérez D. se encuentra bajo una Licencia Creative Commons Atribución-NoComercial-CompartirIgual 3.0 Unported. 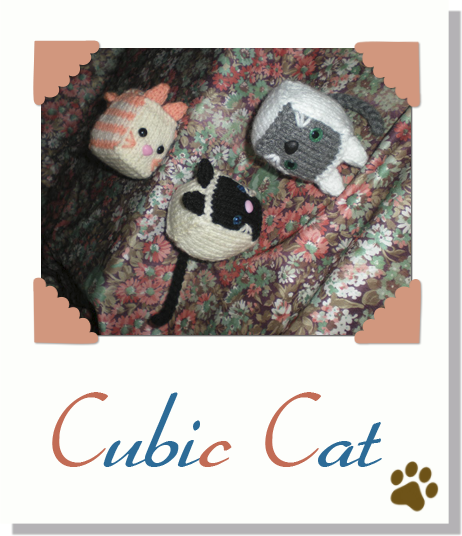 This purchase is available on Ravelry: Cubic Cat Amigurumi! You can knit for personal use, as a gift for a loved one, as decoration, as a toy for children or put a bell inside or catnip and give your pet as a toy! But attention! To use as a toy always use safety eyes and nose or items that can not be easily ripped to prevent accidents in children and animals. I would love to see your projects!! precioso diseño pero el patrón no se puede descargar. Hola Julia! No se cual es tu problema, revisé el enlace y está perfecto, lo descargué, lo abrí en mi PC y lo visualizé sin ninguna incidencia. Prueba a clickear otra vez o intenta descargarlo en español en la sección de "Patrones Gratis"
Thank you very much for the adorable kitty pattern. It's perfect for the things I'm making for the local cat rescue group.